Having identified the potential of the innovative continuous rope mussel on-growing system to develop the Irish mussel farming industry, we imported and trailed the technology, successfully adapting it for use under Irish conditions. The technology allows our farmers to produce a high value seafood product efficiently, using environmentally sustainable techniques. Traditional methods of rope mussel farming are labour intensive, involving the manual cutting of mesh and rope and packing of young mussels by hand. The continuous system allows the packing to be mechanized by using continuous, collector mesh and grow rope – a far more efficient technique. 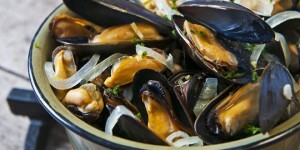 We imported the technology for potential use on Irish mussel farms. We initiated the technology transfer by working with producers (in the late ‘90s) to assess the effectiveness of the continuous ropes, and to undertake a systematically evaluation of the system when employed under Irish conditions. The deployment of the technology was successful and 65-70% of the sectors annual mussel production is now farmed using the continuous system. The grow ropes (which the mussels attach to) can be recycled and re-used for many years. The collector mesh or cotton sock – that holds the mussels to the rope while they adapt to their new environment – is biodegradable. An automated harvesting system using a venturii pump has now been installed on 2 farms with excellent results. To assist with the supply of biodegradable cotton socking used in the system, we have helped to establish a domestic manufacturing operation to produce the socking. This guarantees the supply and allows for the quantities required by our industry.